Enabling the “Add Contacts button which creates contacts into Active Campaign from Nectar Desk Dial Pad” in the settings for Active Campaign will add a Create Contact button in the Dial Pad window. Customer information filled in on this screen will be saved to the Active Campaign list chosen. When pressing on the “Create Contact” button a form will pop out that will require you to enter the contact’s information. You are able to specify the list you would wish to add the contact into as well as assign tags to the contact. 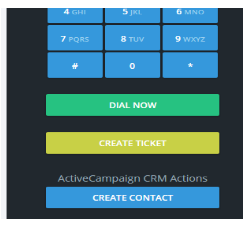 By pressing on the Create Contact button on the button of the form the contact will be added in both Nectar Desk and Active Campaign platforms with contact’s details will be reflected on both ends.